EDGEFEST 2012 ANNOUNCES FIRST TIME ELECTRONIC STAGE! TORONTO – MAY 25, 2012: Toronto’s biggest summer music festival has gotten a little bigger this year. Edgefest is pleased to announce that Yukon Blonde has been added to the official lineup. 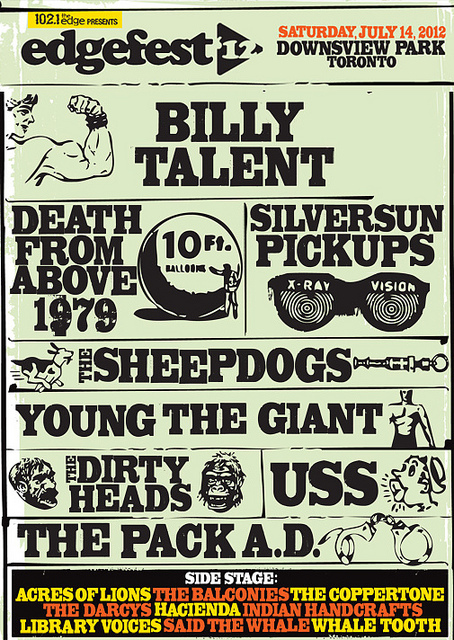 The band will join an already stellar collection of bands (Billy Talent, Death from Above 1979 and more) at Downsview Park on Saturday, July 14th this summer. If that wasn’t enough, for the first time Edgefest is introducing ElectronicEdgefest. The electronic dance tent at Edgefest will explore an exciting brand of music with performances from up-and-coming DJs & hip-hop artists. It will be a daring departure from the rock music of traditional Edgefest. The clear-span tent will be presented like a club with a stage, bars, and lighting to enhance the experience. This will be an opportunity all music fans to get the best of their Edgefest experience. (855) 985-5000. Ticket information is also available at www.edge.ca. Experience Edgefest as a VIP – a limited number of tickets are available. VIP tickets include guaranteed access to the pit, VIP only bars, food sales and restrooms plus an Edgefest t-shirt. VIPs also receive “Fast Pass” entry into the venue. VIP tickets are available for a limited time and while supplies last for $72.50. Long regarded as Canada’s most influential new rock station, 102.1 the Edge (CFNY-FM) is home to The Dean Blundell Show. Part of the Corus Radio network of new rock stations, 102.1 the Edge is proud to air the best in new rock programming. Tune in to 102.1 the Edge on the FM dial or listen live at www.edge.ca. 102.1 the Edge is owned by Corus Entertainment Inc., a Canadian-based media and entertainment company. Corus is a market leader in specialty television and radio with additional assets in pay television, television broadcasting, children’s book publishing and children’s animation. A publicly traded company, Corus is listed on the Toronto Stock Exchange (CJR.B). Experience Corus on the web at www.corusent.com. Established in 1985, Goldenvoice is a full service local concert promoter based in Los Angeles producing over 400 shows per year throughout North America. Goldenvoice and it’s parent company AEG Live host the most critically acclaimed music festivals in the U.S. Goldenvoice created and operates the award winning annual Coachella Valley Music & Arts Festival as well as Stagecoach: California’s Country Music Festival. In addition, AEG Live, co-produces both the New Orleans Jazz & Heritage Festival and Bumbershoot: Seattle’s Music & Arts Festival.